What do people remember about their favorite restaurants or establishments aside from the food or the company? It’s the ambiance for some, while it’s the looks of the place for others. It’s usually the name and the storefront that people first see, and these tend to leave a lasting impression on the viewer. Visuals DO matter, and these visuals become associated with their favorite places. More often than not, these visuals are helped along by flashy, colorful lights that are very pleasing to look at – and this is what many people remember about their local haunts. Neon signs, in particular, tend to leave a lasting effect. Montreal has a rich selection of these memorable signage and places. It could be a local restaurant with flashy neon lights outside where someone had a date with his first love, or a local pub with a little neon sign outside where she regularly meets her friends for ladies’ night. Here are some of the best neon signs in Montreal, Quebec that leave many locals and tourists in awe. Founded in 1927 by Montreal local Myer Dunn to the delight of meat lovers, this place has become famous for its steaks and smoked meats. Dunn’s Famous used to be decorated with very flashy and colorful neon signs, the sight of which was enough to make many a local’s mouth water. The storefront really gives off a very welcoming feel, probably another reason why this place is so memorable for many locals. Founded in 1896 by Edward Archambault, Archambault went on to become one of the largest music retailers in Quebec. Initially starting off as a sheet music store, Archambault eventually became the go-to place of local musicians to get sheets. The store eventually branched off to other locations, and expanded their selection to include records, books, musical instruments, toys, and more. The Archambault Musique neon sign is still iconic to this day – giving nostalgia to veteran musicians, and anticipation to younger ones. Le Red Tiger, a Vietnamese restaurant, is a relatively new addition to Montreal. It was founded in 2015 by Emilie Nguyen, Phong Thach, and Dan Pham. Serving Vietnamese cuisine and a large variety of cocktails, this pub has become a favorite of younger generations. Aside from the items that they serve, the place has also become famous for its neon sign hanging above the counter – “Cang dong cang vui” meaning, “the more, the merrier.” This just proves that a flashy exterior helps, but a conversation piece on the interior makes a place even more memorable! The Farine Five Roses sign has been part of the Montreal skyline since the 1940s. Initially installed to advertise a brand of flour, as one of the best neon signs in Montreal, it eventually became a well-loved icon by locals. Sitting on top of a building owned by ADM, this sign has quite a rich history. The view from St. Lawrence wouldn’t be complete without it. 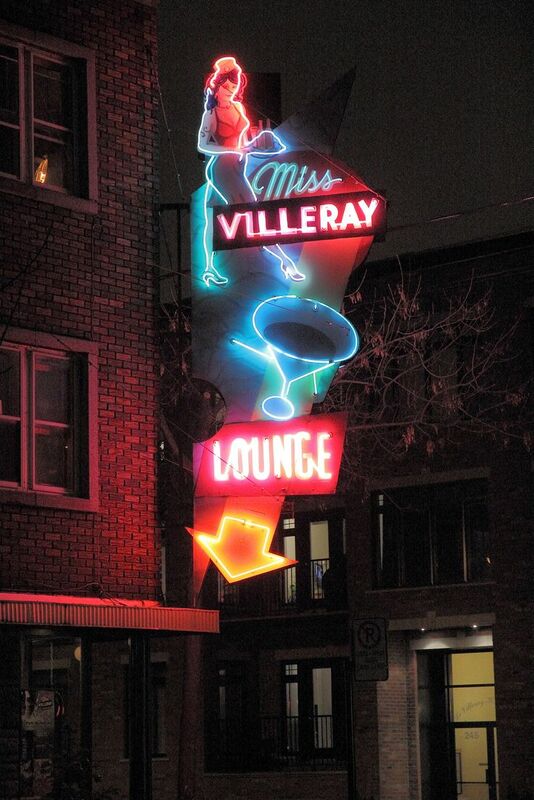 Miss Villeray, a pub and a local staple due to its warm atmosphere and iconic neon sign, has been around since the 1960s. This place has seen many generations of patrons, a handful of which were famous in their time. The place changed ownership in the 2000s but the feel remained more or less the same. It boasts a touch of vintage here and there, still serving great menu items, and still being the welcoming place that it originally was. Moreover, the neon sign remains an icon in this area. A neon sign with the pub’s name, a cocktail glass, and a beautiful woman (a local who lived during the World War II era, research says), definitely draw attention to the place. The Neon Alley is a little street located in the Old Port area, and is riddled with neon signs ranging from little signage of foreign characters, to larger, more intricate displays of street art. The Neon Alley has gone viral on social media, and with good reason. The excellent blend of lighting coupled with a very retro-styled street and a number of buildings look great in photos and many locals and tourists just couldn’t resist taking snaps of this odd but charming street. 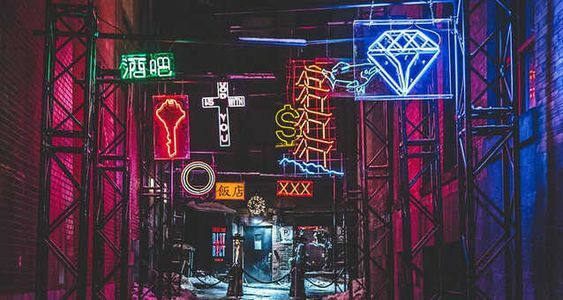 Because of the overwhelmingly positive response of the neon signs on social media, The Neon Alley has been said to revitalize the interest in neon signs which were popular in Montreal in the past decades, but have seen lesser and lesser use the past few years. Now that you have proof that sometimes, it’s the signage that helps make a place memorable, why not get one made today? Make sure to contact a reputable and experienced sign maker to ensure the best quality!